…and another thing!–I am jealous of the FLIR system on the orbiting police helicopter above! It would be cool if I had a thermal imager in my cruiser to pick out bad guys hiding in the darkness like those rotorheads up in the chopper. Well, someone has come up with just this idea. I had not seen the NOPTIC, nighttime optical thermal imaging camera, until recently. 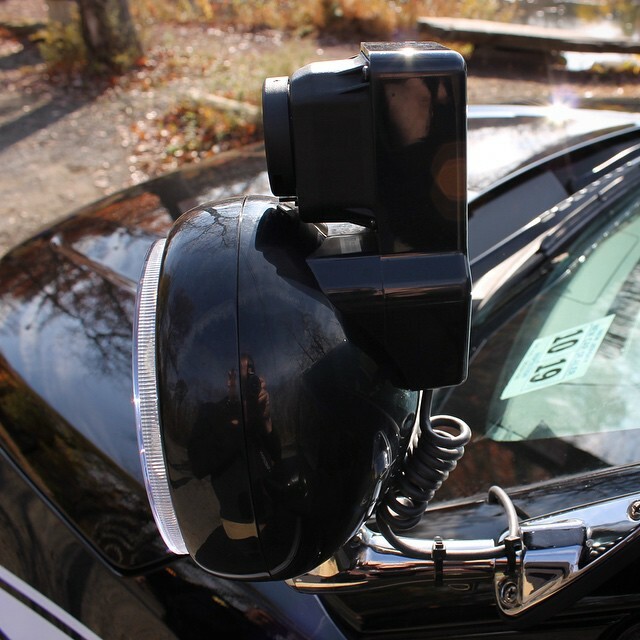 The NOPTIC camera mounts on the A-pillar spotlight of a police car and sends infrared imaging back to the in-car computer screen so the officer can see at night without the compromises of a visible light beam. Using a passive IR camera, the NOPTIC unit allows an officer to stealthily locate suspects at an officer safety advantage. As you can see from the videos, you find them before they even know they are under observation. The NOPTIC camera mounts to an existing spotlight and operates between -40 degrees and +176 degrees. It has been tested for function in heat, thermal shock, mechanical shock, vibration, drop, immersion, salt water, hot water, humidity, and chemical contamination. The camera is rugged. Because it is thermal, there is no blinding of the user’s screen by extraneous light sources. Besides spotting that perp in the bushes, the NOPTIC system has uses for finding recently driven vehicles, detecting latent images of residual heat (the suspect posted up for a while next to a building then ran off), and increased driving safety by imaging up the road three to five times farther than a cruiser’s high beams. This is a great tool for nighttime duty that I wish I had during my time on Midnights. Just last night, my wife and I were on an errand, driving through a residential area. I was squinting around in the darkness between houses when she turned to me and said, “Stop patrolling!” Sorry, old habit. The MSRP for a NOPTIC unit is about $4,000. Damn. I’d like to put one on my Audi. This entry was posted in Officer Safety, Street and tagged FLIR Police, NOPTIC, police night vision, Thermal Image Searching, Thermal Imagers for Law Enforcement. Bookmark the permalink.